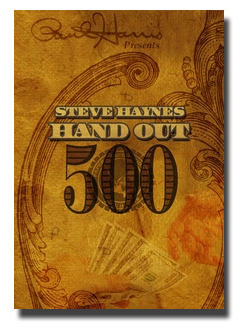 Today, when you order "Hand Out 500 by Steve Haynes", you'll instantly be emailed a Penguin Magic gift certificate. You can spend it on anything you like at Penguin, just like cash. Just complete your order as normal, and within seconds you'll get an email with your gift certificate. What it is: You introduce four or five one dollar bills. 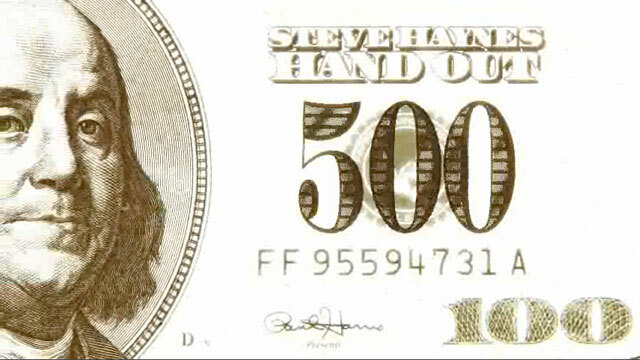 You then put a small fold in the bills so that the spectator can see the face and back of the bills at the same time. You then cause them to change into change into hundreds (or fives, tens, twenties, fifties. Depending on how you make your gimmick). You can now hand out the bills for examination. The DVD: The layout on the DVD is excellent.....almost. The chapters aren't cut exactly right, but close enough. It could just be my computer, but by the clean-up section I pressed fast-forward and it wouldn't stop until about two chapters later. Teaching: The teaching on this DVD is very good. The construction of the gimmick is taught by Steve making it. Just some comfortable music in the background. Steve is a lefty, so the teaching is just a little awkward. The routine is taught very, very well. 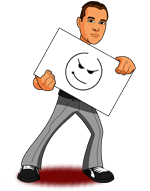 The Gimmick: The gimmick is just cool. It isn't too difficult to construct. It will take about 15 minutes to make. You will need rubber cement before getting this. Just like the preview says, there is no extra thickness. Difficulty: Some of the changes are a little hard but with practice will be a breeze. The Wave: This is the one that Steve does first thing in the preview. It's nice, but angle sensitive. The Flutter: This is the one in the preview that is done by a window. It's very pretty, easy to do, and completely angle-proof. The Jolt: I love this one. It reminds me of the Underground Change from Extreme Burn. No cover whatsoever. Overall: Packs flat, plays big. I love it. I own every single handling of Pat Page's Easy Money ever shared with the magic community. I received Handout 500 the other day, and this is THE BEST handling I've ever seen. Even if you don't want to hand out all of the bills, the changes are more impressive than any other variation out there. I used to be a big fan of Extreme Burn, but this is better. I wouldn't have any trouble recommending this to anyone. This trick looks great. BUT. I do NOT think this is worth it. At all. I bought this when it first came out and put so much time and effort into this trick, but in the end it wasn't worth it at all. Everyone I have showed this to has figured it out, and Im not bad at performing it. It just is too obvious. Extreme burn and Extreme Burn 2 have been great however **sold at Penguin** and I would highly recommend getting that instead. Same price, better trick. I have got so many great reactions with this effect and it is guaranteed to get those WTF!!!! reactions the gimmick is kind of hard to make but it is well worth it to make it even though it will take at least 2 hours the first time you make it but after that you'll be set to do it for a lifetime (almost). This a a great effect.I like Extreme Burn better because you can show the bills much more freely....and..who in the World would be dumb enough to hand out 0.00! I had gotten Hundy 500, (which is great) but never got a chance to put it together. I got this one, and was glad I waited! This thing is AWESOME! The only problem with the video explaination is the music/text, rather than voice-over in the construction explaination, but all of his various ditch methods are genious, and make up for it! It is fun to practice, even though it requires less practice than a lot of things. It's one of those tricks that is so good that I want to lie and say it is horrible so less people buy it, and are out there doing it... But I cannot tell a lie, So, buy it! Hand out 500 handling is simple, clever, practical and ingenious. Sure, you can do this trick without palming; however, the trick looks best with the palming option. I still think there are angle issues and you do have to be careful about thickness. The concept is great because you can hand out the $$$, but Extreme Burn is a better trick.